Recombinant fragment, corresponding to a region within amino acids 303-609 of Human IKB zeta (UniProt Q9BYH8). Our Abpromise guarantee covers the use of ab155142 in the following tested applications. Involved in regulation of NF-kappa-B transcription factor complexes. Inhibits NF-kappa-B activity without affecting its nuclear translocation upon stimulation. Inhibits DNA-binding of RELA and NFKB1/p50, and of the NF-kappa-B p65-p50 heterodimer and the NF-kappa-B p50-p50 homodimer. Seems also to activate NF-kappa-B-mediated transcription. In vitro, upon association with NFKB1/p50 has transcriptional activation activity and, together with NFKB1/p50 and RELA, is recruited to LCN2 promoters. 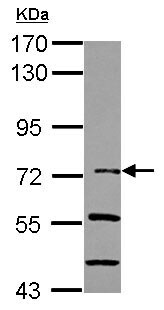 Promotes transcription of LCN2 and DEFB4. Is recruited to IL-6 promoters and activates IL-6 but decreases TNF-alpha production in response to LPS. Seems to be involved in the induction of inflammatory genes activated through TLR/IL-1 receptor signaling. May promote apoptosis. Expressed at high levels in peripheral blood leukocytes and lung, at moderate levels in liver, placenta, and at low levels in spleen, kidney, skeletal muscle and heart. Nucleus. Aggregated in dot-like structures. Colocalizes with NCOR2. Publishing research using ab155142? Please let us know so that we can cite the reference in this datasheet. There are currently no Customer reviews or Questions for ab155142.